Cipher is a work of contemporary vocal art that unravels the form of North Indian raga to excavate the transformative potentials embedded in rupture and loss. The voice is a thread that navigates the multitudes of geographies, histories, and energies that inhabit us. Cipher touches the bottom of what moves the voice to utter, and the transparent surface where we see its shapes—all within a live, vibrational space. The “vocabulary” heard in Cipher is tarana- a genre in Hindustani classical vocal music mixing Persian, Arabic, and Sanskrit syllables said to encode mystical meanings. I collaborated with Samita Sinha to build the set for Cipher: Sinha singing with an electronic tabla (Indian drum) that is suspended on a block of resin. A mixer, connected to a swinging microphone that catches Sinha’s voice when it passes by her mouth. Sinha moving in the light of a triangle that was outlined in twine. Cipher is produced by MAPP International. Cipher received support from National Performance Network (NPN) Creation Fund project co-commissioned by Portland Institute for Contemporary Art (PICA) in partnership with REDCAT, Atlas Center for the Performing Arts, and Center for the Arts at Virginia Tech and NPN. Cipher was co-commissioned by Wexner Center for the Arts at The Ohio State University, and was developed in part with the support of BRIC (Brooklyn, NY) and Atlas Center for the Performing Arts (Washington DC) and Topaz Arts (Queens, NY), and received funding support from the National Endowment for the Arts. bewilderment and other queer lions, commissioned by Performance Space 122 and The Invisible Dog Art Center, was presented as part of COIL festival 2016. Created and composed by vocal artist Samita Sinha with direction by Ain Gordon, bewilderment and other queer lions is an intimate, immersive experience of voice, sound and image that radically transmutes Indian music traditions through the collaboration of composer Samita Sinha with musicians Sunny Jain (of Red Baarat) and Grey Mcmurray. Along with acclaimed visual artist Dani Leventhal and lighting designer Devin Cameron, Sinha digests a wide range of texts and imagery meditating on desire and diasporic experience to prophecy a mythic future. I collaborated with Samita Sinha to build the costume: Sinha wearing finger extensions that I made with tampons, ribbon and horse tail hair. 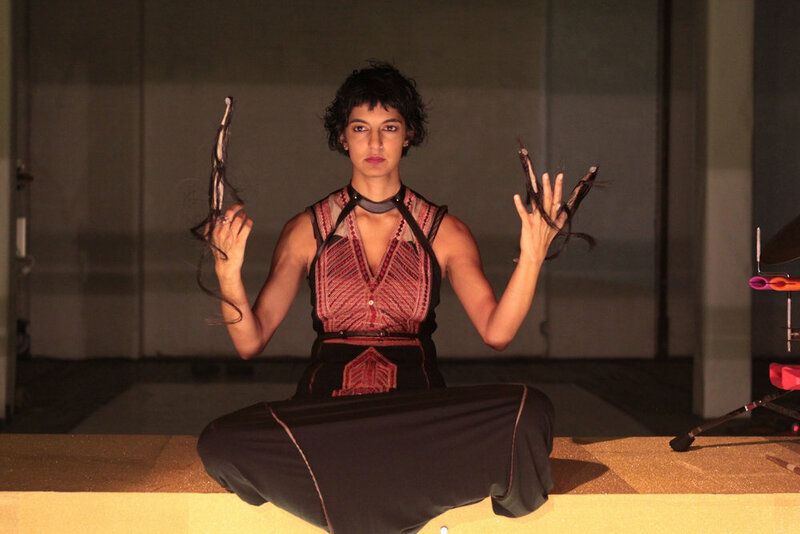 Vocal artist Samita Sinha composes performances using voice, body and sound by taking apart the Indian tradition to process the sensations and psychic charge of being a body in the world. Works include This ember state, commissioned by Asia Society and set to premiere in April 2018, and bewilderment and other queer lions, commissioned by Performance Space 122 for 2016 COIL Festival. Her solo performance Cipher toured nationally in 2014-15 (The Kitchen, PICA’s TBA Festival, REDCAT, Wexner Center for the Arts, Virginia Tech), with support from National Endowment for the Arts and National Performance Network. Sinha has composed and performed original scores for dance and theater works by Dean Moss, Fiona Templeton, and Preeti Vasudevan, vocal directed Daria Fain and Robert Kocik’s Commons Choir, and toured internationally as a vocalist with Sekou Sundiata. Sinha also works extensively as an educator, through private workshops as well as at the Rubin Museum, Centro Nacional de las Artes in Mexico City, Millay Colony for the Arts, and Movement Research.